On Sunday we upgraded Golf Nations to version 2.0, a powerful renovation that includes many enhancements you’ll want to explore. Here are a few of the updates included in the new system. 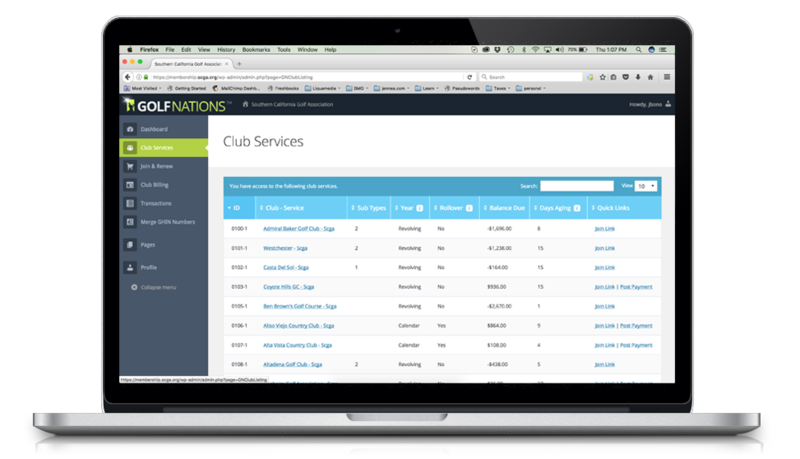 Never before has anyone built a club billing system that syncs with GHIN in real-time and supports a revolving calendar year. Our Club Billing product integrated with our Join and Renew product are a powerhouse duo, sure to simplify your association’s accounting processes and help grow your membership base. We’ve created a powerful new database structure that syncs with GHIN real-time. This way, if GHIN is unavailable for any reason, your Golf Nations site will continue to run without interruption. Transactions will continue to process and webpages on both the admin panel and the customer-facing site will load much quicker than ever before. Not only does Golf Nations 2.0 look more sleek and refined, we’ve overhauled the admin panel user interface to ensure you can easily find anything you need. You can now update a golfer’s contact information in Golf Nations. We’ll push that change to GHIN real-time. The ability to add a golfer to GHIN through the roster. The ability to select for each individual golfer whether or not they roll over into the next year. Those that don’t roll over will be inactivated in GHIN automatically; no need to use GHIN expiration dates anymore. The ability to see every golfer’s payment status, even those who are paid for by check. In addition to full refunds, you can now process a partial refund through Golf Nations. Keeping your data up-to-date is key in any software system. You can now enter all GHIN merges into Golf Nations after they’ve been merged in GHIN. Unfortunately, due to limitations in the GHIN API, you still have to merge them in GHP first.